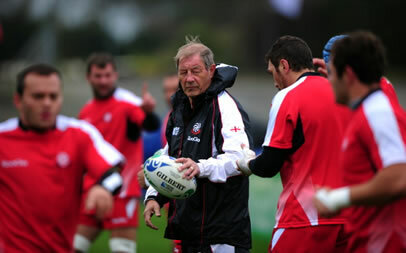 Scotland-born Georgia coach Richie Dixon has bemoaned the Rugby World Cup scheduling which sees him team playing their first Rugby World Cup game against Scotland who will be playing their second world cup game. The former Scotland test player might have been correct in his count of early matches in Pool B but Scotland’s starting XV on Wednesday announced by England-born coach Andy Robinson contains only four players who started against Romania on the weekend. Dixon laughs when asked if he’s heard the one about the Georgia rugby team using spare parts from an old Soviet tractor as a scrummaging machine. The affable coach admits that could very well have been the case before he arrived in Tbilisi last November to take over a squad making its third appearance at the Rugby World Cup. But Dixon, a former Scotland flanker, is pleased to report that his team now has a proper, regulation training aid for its forwards. More importantly, he’s passionate about the future of rugby in the country, predicting it will someday supplant football as the No. 1 sport in Georgia. The “Lelos,” as the team is known, face an uphill battle on the playing fields here, though, with only one win in eight matches in previous World Cups. It begins play at this version Wednesday against Dixon’s former national team, Scotland, at Rugby Park Stadium in Invercargill. Back home in Georgia, where Lelos refers to “lelo-burti,” or lelo-ball, an ancient free-for-all form of football, new regulation-sized rugby pitches and stadiums and training facilities and a surging interest in the sport has Dixon excited. He stresses “regulation-sized” for a good reason. Banned from most football pitches, rugby teams had to train on pitches often 40 to 45 meters wide, or long, depending on which way the players looked at it. “Even if you turn it around the other way, you can’t develop a rugby program like that,” Dixon told The Associated Press in an interview. Things have changed in the past few years, Dixon says, and the upsurge is noticeable even since his arrival nearly a year ago. His new estimate is that nearly 6,000 are playing the sport at some level in Georgia. There was a football match happening the same day at the bigger stadium, hence the forced move to the smaller venue. But if rugby is a work in progress in Georgia, it’s progressing pretty well. Dixon credits the players with creating that level of excitement. He talks frequently of “how proud I am of the boys.” On Tuesday, on the eve of their first match, the players visited a primary school in the morning and a local hospital in the afternoon. “Most of the guys are born in the villages, when they are youngsters they do lots of chores,” Dixon said. “I think their strength is quite natural, and obviously it is topped up by work in the gym.